Aloha! Welcome to the Wailua River’s most popular tour. 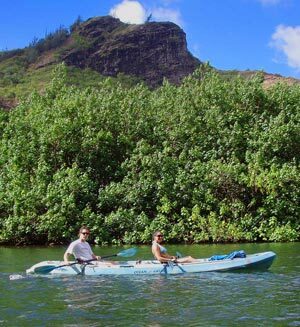 Paddle the majestic Wailua River, which is the only navigable river in Hawaii. This peaceful river winds through a tropical garden paradise of abundant palms, ferns, flowers and wildlife. Paddle past Kamokila Village, where the opening scene from the movie, “Outbreak,” was filmed. It is also a cultural village depicting the Hawaiian civilization back in the 17th century. Soon you will come to the North Fork where you will paddle leisurely through the Garden Isle’s most beautiful jungle river until you come to the trail head for Secret Falls. Enjoy a moderate hike through the Wailua rainforest, original home of the first Hawaiians, who paddled from the Marquesas Islands to Kauai almost 1500 years ago. Hear the legends and learn about the flora and fauna of Kauai’s most sacred area. The final portion of your hike is to the enchanting Uluwehi Waterfall, which descends 125’ into a natural pool surrounded by rocks and vegetation. Take a refreshing dip and play in the pool which was once only reserved for a king! The sacred Wailua was the land of ali’i (kings) and was once the center of chiefly power on the island. This royal center was the political, religious and social center of Kauai’s chiefs who resided in this area. The Wailua Complex of Heiaus is a National Historic Landmark, located on the hillside above the Wailua River. AM and PM check-in times available. The 4.5-5 hour trip includes a picnic lunch with your choice of ham, turkey, roast beef or vegetarian. Picnic lunch after choosing ham, turkey, roast beef or vegetarian sandwiches plus fresh pineapple, chips, cookies & bottled water. 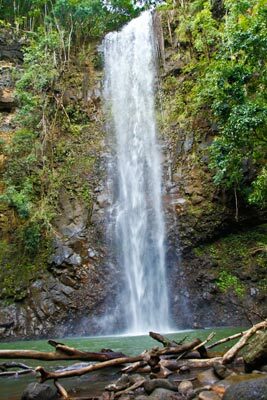 Your expert Kauai guide can also answer many other questions about our beautiful island. Kayak Adventures is devoted to making your time with us the most interesting and fun of all the activities available on our beautiful island. It’s a good idea to book your trip with us in advance of arrival. We only take 12 people on each of our morning tours – 6 days per week. **There are no Wailua River guided tours allowed on Sundays.